PINE (Printing Industries of New England) held it’s annual contest for the best in printing. 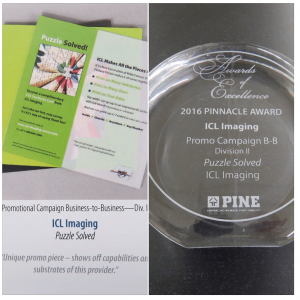 ICL Imaging came away a winner with it’s “Puzzle Solved” entry in the “Promotional Campaign Business-to-Business” category, PINE’s Pinnacle Award. The 4 pieces showed ICL’s direct to print and finishing capabilities. PINE has announced that ICL Imaging of Framingham, MA is an award winner in the Association’s New England regional Awards of Excellence Competition. The announcement was made April 13 during PINE’s Industry Awards Gala, held at the Newton Marriott in Newton, MA, with hundreds of industry professionals in attendance. PINE’s Awards of Excellence Competition, attracted over 320 entries from 41 printing and imaging companies across New England competing in a variety of printing and graphic communications categories such as best annual report, direct mail campaign, labels & packaging, and more. 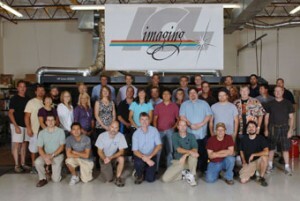 ICL Imaging won PINE’s Pinnacle Award for “Promotional Campaign Business-to-Business – Division II.” A panel of judges with extensive experience in printing and print production, were brought in to examine the wide range of work submitted. Each entry was judged anonymously on its own merit in a category with similar printed pieces. The judging criteria included: registration, clarity and neatness, sharpness of halftones and line drawings, richness and tonal qualities of color, paper and ink selection, ink coverage, difficulty of printing, effective contrast or softness, overall visual impact and bindery. For more information, call Bill Smith of ICL Imaging at 508 – 872 – 3280. PINE is the largest trade association to serve printing and graphic communications companies throughout New England. 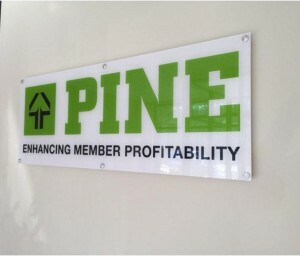 PINE serves more than 360 member companies through a wide range of products and services that enhance member profitability. The Association is affiliated with the world’s largest graphic arts trade association, Printing Industries of America. ICL has been a member of PINE since 2014. Hat’s off to all the employees at ICL that contribute their excellence every day to make us the best!